The Brush and Pencil tools are used to draw and sketch with. 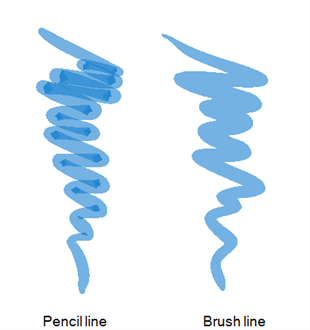 Both tools support pressure sensitivity, allowing you to create lines with variable thickness. 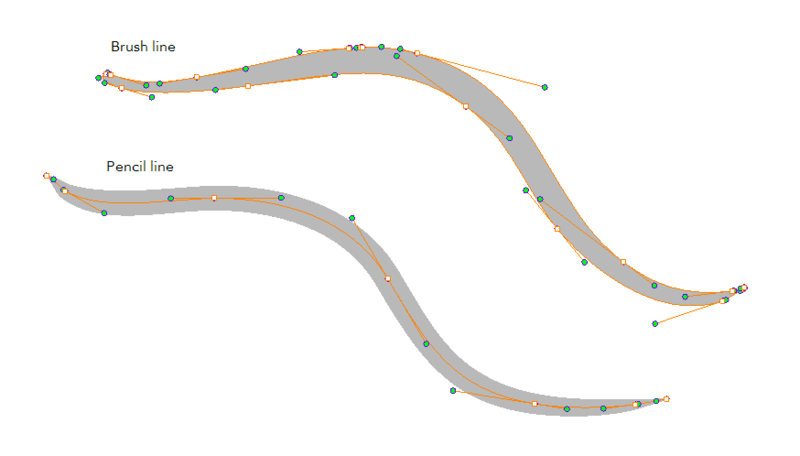 The Pencil and shape tools produce central vector lines. The Brush tool produces contour vector lines. This means that a pencil line’s control points (used to deform its shape) are located along the length of the central spine and the Brush line’s control points are located along the contour. • If you draw with the Brush tool and want to modify the thickness, use the Contour Editor tool. If you sketch a drawing using a semi-transparent colour to get a paper-like feel, you should use the Brush tool as it produces a more realistic and natural feel. The pencil line is very useful for tracing, clean or final drawings. Also, it is recommended to use brush lines when designing cut-out puppets’ articulations which use patches.